In spite of how popular they've become with certain sub-cultures, glasses can be a pain. Not only do you have to keep buying new ones, they also have an annoying tendency to impede intimate contact, slip off noses, shatter when dropped, and, well, the list goes on. Luckily, it looks like there's might be a solution lurking on the horizon. 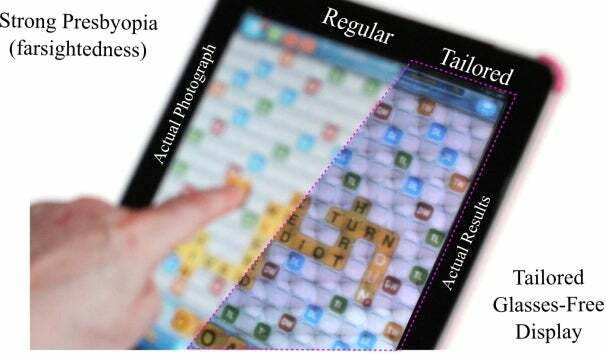 Tailored Displays is a nifty project that was presented at SIGGRAPH this year, and it "uses measurements of refractive errors and cataract maps to free the viewer from needing wearable optical corrections when looking at displays." The hardware, it seems, is composed of the same dual-stack of LCDs that you can find in a Nintendo 3DS but at a higher resolution. To work, all they need is the your eyeglasses prescription data. I'm a bit dubious about how valid these claims are but, according to the website, Tailored Displays are capable of--if they work as advertised--correcting nearsightedness, farsightedness, and astigmatism, to name a few vision problems. The whole thing basically works through magic. Inspired by consumer light-field cameras, these tailored displays "enhance visual acuity by decomposing virtual objects and placing the resulting anisotropic pieces into the subject's focal range," according to the company They apparently adapt light fields in order to compensate for the individual's inability to focus, something that is accomplished by "pairing light-field rays and retinal positions to associate a raw intensity to each ray and normalizing retinal pixels." The end result, to phrase it in the simplest way possible, is a device that adjusts itself to compensate for your visual problems. In other words, magic. Yup.